When someone dies from cancer, their families are left to champion the cause. This is the case for Daniel (8) and Oliver (6) Simpson, who are campaigning for stomach cancer research in memory of their Dad, Matt. Matt was diagnosed with a rare form of stomach cancer called linitis plastica in October 2012. He had no major symptoms and was otherwise strong – the diagnosis was shocking. He passed away in 2013 when he was just 40 years old, leaving his young family devastated. Men are particularly at risk of stomach cancer – they are almost twice as likely as women to be diagnosed. It is an aggressive and deadly disease. Daniel and Oliver’s mother, Trine, knows the devastating effect that stomach cancer can have on families first-hand. 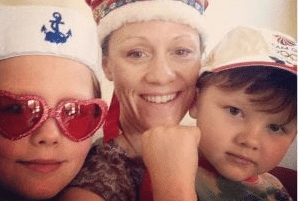 Five years on, Daniel, Oliver and Trine have started the Silly Hat for Matt challenge to honour Matt. Along with 100 other people around Australia, they have run, climbed and swam – all while wearing silly hats – to raise awareness and much-needed funds for stomach cancer research. Daniel and Oliver are champions in their own right, having raised over $4,000 and even convinced their whole school to wear silly hats for their Dad, Matt. “Dad loved wearing silly hats and I think everyone should wear them more often,” says Daniel. There is hope. Research in to stomach cancer over the past few decades has had an impact, evidenced by a 10% rise in 5-year survival rates since the mid-80s. More research needs to be done so that the options for patients can continue to improve. “I’m hoping what we are all doing here will help others in the future to not have to answer those same questions about their loved ones because of the availability of far better treatment options,” says Trine. Find out more about the Silly Hat for Matt challenge here.